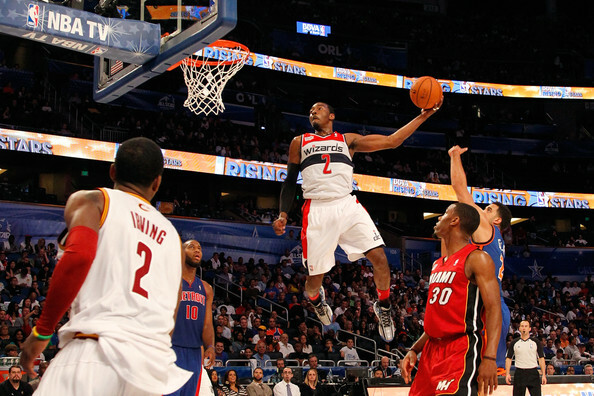 Will John Wall make The Leap to All-Star status this season? NBA preseason doesn’t mean an awful lot. It’s perhaps a bit more important for a team like the Wizards — a bad team trying to get into the playoffs for the first time in awhile. But even then the information it provides isn’t all that…informative. The regular season Wizards will get a significant boost from the preseason Wizards because of their move last Friday to acquire center Marcin Gortat. The veteran takes the spot vacated by the injured Emeka Okafor, who was sent to Phoenix (along with a first round pick). I’ll get to my projection/prediction for the season in a moment, but first, a look at the preseason numbers. I’m not wasting time with the team-level stuff. The Wizards were terrible on offense and excellent on defense during the exhibition games. That’s theoretically a way to win games — a 68-65 win counts as much in the standings as one that’s 114-111. Still, being good on both ends would be preferable. If there’s any takeaway from the team-level preseason numbers it’s that the team was similar to the one they had last year (not surprising considering their few personnel changes), which was characterized by terrible offense and excellent defense. Looking at the individuals, I’d conclude that most of the roster underwhelmed. Bradley Beal and Trevor Booker played well; Nene was okay, but not performing at the level he’s maintained throughout his career; and the rest…pretty bad. John Wall, the guy they’re building around, was awful. He shot badly from everywhere (.415 from two-point range; .118 from three-point range; just .727 from the free throw line), and committing 4.4 turnovers per 36 minutes. Below is a table showing an “estimated” Player Production Average (PPA) for each player. I say “estimated” because PPA is based on league average season by season. That average is fairly consistent year to year, but there are fluctuations. Since it’s preseason, there isn’t enough data to calculate a true league “average” so I use an approximation of league average. Also, full PPA adjusts for pace, accounts for individual defense and includes a “degree of difficulty” factor — none of which I’m including in looking at the preseason numbers. In PPA, average is 100, higher is better, and replacement level is 45. That last column is the player’s PPA in 2012-13. Except for Al Harrington, who missed most of last season with a staph infection. Again, don’t read too much into the preseason numbers. The play of Beal and Booker are hopeful signs. Also good to see Jan Vesely doing something positive on the floor — he actually led the team in rebounding in preseason. I’m not overly worried about Wall’s poor play, although it would have been nice to see him pick up where he left off at the end of last season. If you’re thinking you’ll see better play from Eric Maynor once the season begins, stop it. At best the Wizards are likely get replacement level production from him. Other potential cautions: Martell Webster and Kevin Seraphin were bad. Webster’s play is potentially worrisome because he hasn’t established himself to the point where his production level is a given. Last year, he had a terrific preseason, and it translated into a solid regular season. This year? Hard to say. Seraphin’s preseason performance, is unfortunately matches up with most of the data on him. He was inefficient, turnover prone and rebounded like a SF. Ariza’s preseason stats don’t mean a whole lot. He’s well-established and fairly consistent. He’ll provide the team with another season of stellar defense and meh offense, which will grade out to about average. Given the team’s offseason moves, it was clear that the team’s fortunes this season rested on the health of three players: Wall, Nene and Okafor. Now that they’ve traded for Gortat, their fortunes rest on the health of three players: Wall, Nene and Gortat. They don’t have quality depth behind any of these three. While my projection relies on statistical data, there’s a fair amount of guesswork in divvying up minutes. The table below shows my estimates of games played, minutes played, and PPA. The estimates for games and minutes are a combination of player history, analysis of similar players in the NBA record, and logic. PPA estimates incorporate each player’s individual performance history, analysis of historical similars, and aging effects. LS = last season, except for Harrington. My approach projects Wall making The Leap to All-Star level production, whether he makes the team or not. It also projects significant improvement from Beal, although it suggests he’s another year from making The Leap himself. I’m also expecting bounce-back years in per minute production from Nene and Gortat. I’m expecting regression from Webster both in terms of overall production and in health. I crunched the numbers on several different scenarios. In a best-case situation that assumes near perfect health, the Wizards could win 48 games. My worst case projection has them at 34 wins. Final prediction: 43-39, and the Wizards get the 7th seed in the playoffs. For those who are curious, here’s how the projections looked with the various possibilities between Okafor, Gortat and neither.